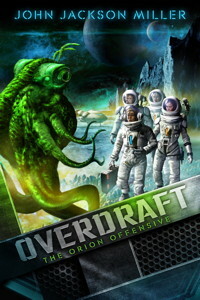 With Overdraft: The Orion Offensive now ongoing as an Amazon serial, I thought I'd do something new: with each episode that releases, I'll be posting my Overdraft Glossary of characters, locations, and concepts, current as to the most recent release. Click here to check it out. It's a file I have kept up to date as I've written; the full file already has the material on all the later chapters, but what you're seeing now just covers episode 1 of The Orion Offensive, as well as the original "Human Error" story. If time allows, I will also do the same thing with the historical timeline for the series. The second episode downloads automatically on Tuesday, April 16. If you've already subscribed, it will appear magically in your Kindle account; if not, it's still available at the price of $1.99 for the whole series. You'll get the earlier episode too. I'm very gratified by the response to the first episode; the work's been doing well on the Kindle bestseller lists for military and high-tech sci-fi. I think the serialized fiction idea is a cool one, and I'm glad to see it's making inroads. Which reminds me: click here to see my guest post this week from the official Kindle blog -- and here to see my interview with RoqooDepot about the series. See you in your Kindle, next Tuesday!